(Phuket Post) - Families traveling with babies and young children know how stressful and expensive it can be. There’s always a lot to remember, from making sure that you have the right things packed for the journey and also for the stay in your hotel. If you have more than one child then it’s enough hassle to stop you travelling all together. Families travelling to Phuket now need not worry, however, because Phuket Baby Rentals has got the situation under control. All the travellers have to do is go online, make use of an easy ordering system and all the baby equipment and baby supplies that they need for a relaxing holiday will be delivered to their destination, free of charge. No hassles and no worries. The idea for Phuket Baby Rentals came to founder Jackie when she was visiting Phuket with her daughter. “After traveling to Phuket several times from the States with a baby, before I moved here permanently, I saw the tremendous potential for a quality baby equipment rental company in Phuket,” he said. “Once parents see how liberating it is to travel without hauling all of the accessories needed for their children, taking a holiday becomes that much more enjoyable for them and Phuket is a very family-friendly island.” With many airlines now eliminating free baggage, it’s becoming even more expensive and difficult for parents to travel with important safety equipment like car seats. In addition to the added cost, checked baby equipment often becomes damaged and dirty in transit. With Phuket Baby Rentals’ equipment rental program, all of the products ordered are delivered, clean and sanitised before the family’s arrival, saving time, stress and money. This is not a unique idea. It is commonplace in Europe and America but no-one had thought of doing it in Asia, until now. So no longer do holidaymakers have to carry all of their baby needs with them, they can now have it waiting for them at the airport, car rental agency, hotel or villa when they arrive. Simple ideas are always the best and Jackie, certainly seem to have come up with a gem here. High standards of cleanliness, brand name equipment, and an easy and efficient ordering system are making families from all over the world take note. Rentals are available for daily, weekly or long-term periods, with a large inventory of products for babies and toddlers, including essential needs such as Pack & Play cribs, high chairs, booster seats, potty chairs and bed rails. Travelling parents can also order products such as activity mats, swings, safety gates, bottle warmers and a whole lot more. “We also offer a premier referral program for property owners and managers. By participating in the referral program, property managers are able to provide guests with home-delivered baby essentials while earning commission on rentals and increasing the likelihood of repeat business,” Jackie explained. (Phuket Index) - Now Serving Phuket – Phuket Baby Rentals’ equipment and supplies rental for traveling and visiting parents. By providing baby and child necessities such as cribs, highchairs, strollers and car seats, their service enables you to travel more comfortably with your children and makes your kids comfortable once you’ve arrived at Phuket. Traveling with babies and young children can be both stressful and expensive. Before you even leave home you have to plan for all of the supplies you will need- somewhere for the baby to sleep, a car seat for transportation, a stroller to get around, and those are just the basics. To think of packing all of this with you would take up a lot of luggage space and with the airlines new baggage fees and tighter limits on acceptable carry-on items with you has not only become less attractive, but almost impractical. Not to mention- what would happen if the airlines lost the suitcase that contained all of your precious gear or damaged your car seat or stroller? Phuket Baby Rentals has a new option for you that is becoming more popular to traveling families- baby equipment rental. Phuket Baby Rentals to Help Keep Baby or Young Child Safe While Visiting Phuket – Every baby item needed to ensure a safe and comfortable vacation can now be arranged ahead of time by going to Phuket. Catering to Phuket tourist planning to bring along baby, infant, toddler or young child, the Phuket Baby Rentals website makes planning a Phuket family vacation a breeze, and it can be done well in advance from the comfort of home and enjoy a holiday worth remembering. 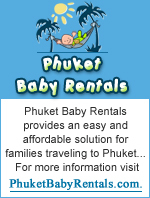 Phuket Baby Rentals Online – Baby Rentals now has a website located at http://www.phuketbabyrentals.com serving exclusively Phuket and surrounding area, offering all the baby furniture, health & safety, toys, equipment and supplies needed to have the family vacation of a life time on beautiful Phuket Island. Free Baby Equipment and Supply Rental Pick Up and Delivery – ‘Phuket Baby Rentals’ tell us they offer ‘no charge’ delivery and pick up of all vacation rental items. Pre-delivery of vacation rental items means there is nothing to do upon arrival to Phuket except head to the beach and begin enjoying the sun, sand and surf. According to the owners, the goal of ‘Phuket Baby Rentals’ is to help make vacationing on Phuket Island as enjoyable as possible. Go to www.PhuketBabyRentals.com to learn more. PRLog (Press Release) – Sep 12, 2009 Phuket, Thailand - New baby essentials provider Phuket Baby Rentals is now offering service to the entire island of Phuket. Vacationing families can take advantage of the ease of ordering rental baby equipment and baby supplies online and having them delivered to their destination, free of charge with a minimum order. Phuket Baby Rentals has the largest selection of name-brand baby supplies in Phuket. From cribs and car seats to high chairs and strollers, Phuket Baby Rentals can provide everything a family traveling with an infant or young child needs on vacation. "After traveling to Phuket several times with an infant before my permanent move, I saw the tremendous potential for a quality baby equipment rental company in Phuket," said Jackie, founder. "Once parents see how liberating it is to travel without hauling all of the accessories needed for their children, vacationing becomes even that much more enjoyable for them. Phuket is a very family-friendly town." With many airlines recently eliminating free checked baggage, it’s even more expensive and difficult for parents to travel with important safety equipment like car seats. In addition to the added cost, checked baby equipment often becomes damaged and dirty in transit. With Phuket Baby Rentals equipment rental program, all of the products ordered are delivered, clean and sanitized before the family’s arrival. Phuket Baby Rentals offers a large inventory of products for babies and toddlers, including essential needs such as Pack & Play cribs, high chairs, booster seats, potty chairs and bed rails. Parents can also order products such as activity mats, swings, safety gates, bottle warmers and more. A total selection of child-proofing products will make any hotel, apartment or home safe for children. Prior to rental, all equipment is sanitized, checked for cleanliness, safety and product recalls. Phuket Baby Rentals offers a premier referral program for property owners and managers. By participating in the referral program, property managers are able to provide the added and valuable service of providing guests with home-delivered baby essentials while earning commission on sales and increasing the likelihood of repeat business. 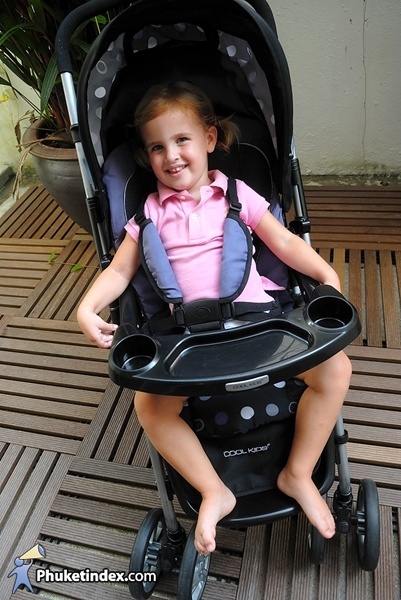 PRLog (Press Release) – April 12, 2009 – Families on holiday in Phuket, Thailand can now rent Baby Equipment like strollers, car seats and cribs and various age related toys from Phuket Baby Rentals. Families traveling with babies and young children know how stressful and expensive it can be. Before you leave home you have to plan for all the supplies you will need – a car seat for transportation, somewhere for the baby to sleep, a stroller to get around and those are just the basics. You still need toys and entertainment and infant tubs or gates for the stairs. To think of packing all this with you would take up a lot of luggage space and as airlines tighten their baggage allowance policies, just how does a family get through the airport with a baby, a car seat, a stroller and a playpen? They don’t....... Now opened in Phuket, Thailand. “Phuket Baby Rentals” helps stressed out parents by renting the latest baby gear and providing travelling families with all the comforts of home. Providing clean, safe baby equipment rentals in Phuket, Thailand. As the leading baby and toddler equipment rental agency in Phuket, Thailand, Phuket Baby Rentals can provide your child with all the comforts of home. ©2008-2017 PhuketBabyRentals.com (a J2 Global Co. Ltd company). All Rights Reserved. private residence anywhere in Phuket. Phuket Baby Rentals is here to make your stay more enjoyable.